One week of musical adventures in San Francisco has taken us a bit longer than one week to share on these pages. But today we look at the final show from that week, featuring Faust at The Chapel. So how exactly does one describe a band like Faust? As it says in the show description from The Chapel, ” Neither the habitus nor the music of this Hamburg group is easy to grasp.” The usual label of “krautrock” isn’t particularly descriptive, though it does orient them within the world of hard rock and experimental music coming out of Germany in the early 1970s. Many of the experimental elements around European and North American rock in that era can be found in their early albums like Faust IV. These elements were in abundance during the performance, with simple but meandering patterns mixed with a multitude of avant-garde elements. And it was all anchored by steady hands of original members Werner “Zappi” Diermaier and Jean-Hervé Péron. There is a basic underlying hard-rock jam underpinning the music, which is then mixed with words, a variety of electronic sounds, and elements that were unique to the San Francisco show, including antiphonal vocals from the Cardew Choir and Lutra Lutra. (We have written about the Cardew Choir numerous times before on this site). The highlight of the collaborations was a final procession to the center of the crowd with large brass instruments dancing above the heads of the audience. This was a contrast to the beginning of the set that featured soft vocals and percussion against a film playing in the background. Another unusual feature of the set was the use of a graphical score, projected so that it could be seen by the audience as well as the musicians. Diermaier even turned his drum set around to face the projected score. This photo also illustrates one other unique element to Faust’s performance: a “knitting lady” sat at the front of the stage calmly and silently knitting throughout the set. I also spied friend and fellow Bay Area synthesizer player Benjamin Ethan Tinker sitting in with the band, which was a fun surprise. The show was sold out to a very appreciative audience and they were well received by longtime fans and newcomers alike. It was definitely a unique and unusual experience, but still one that felt very musical. I would not describe it at all as an evening of “noise” (not that there is anything wrong with that). They lived up to their billing as legendary purveyors of experimental avant-garde rock. Faust was preceded by two opening acts: a solo performance by Bill Orcutt on guitar. It was a softer, but quirky take on blues guitar. Orcutt was followed by Heron Oblivion. While coming out of the milieu of “cosmic guitar music”, they did have a darker, and sometimes frantic sound. They moved back and forth between more frenetic drum and guitar, and that soft plaintive sound in alternative pop. Overall, both acts fit with the theme of the evening, adding a bit of weirdness grounded in various conventions. Optical Sounds is a monthly series at the Center For New Music in San Francisco, curated by Tania Chen with Benjamin Ethan Tinker featuring live improvisation to soundless films. We had the opportunity to attend the most recent installment, which featured a trio of Fred Frith, Beth Custer and Christina Stanley interpreting the 1955 dialogue-less film “Dementia” by John Parker. We at CatSynth often enjoy unusual films, but “Dementia” is weird even among weird films, though the Variety description “May be the strangest film ever offered for theatrical release” seems a bit hyperbolic. The film follows the inner thoughts and actions of a woman as she wanders through dark corners of Los Angeles with even darker characters, while recalling violent events of her childhood. The film is part psychological thriller, part film noir, and part surrealist experiment, constantly jumping between the tropes of all three. The original soundtrack featured music by George Antheil and a section with Shorty Rogers and his band who also appeared in the film. For this performance however, the original soundtrack was absent with Frith, Custer and Stanley providing the music. The constantly-changing nature of the film was reflected in the music, with eerie vocals by Beth Custer, percussive hits by Custer and Fred Frith, and a mixture of processed violin and analog synthesizer by Stanley. Overall, the music was energetic, with moments of chaos, but also some mellower pads by Stanley on synth. They did blend some film-score tropes into the performance, such as eerie sounds for the internal memories and thoughts of the main character, tense bits of sound for the dark streets of the city, and jazzy cabaret style riffs for the night-club scenes – the latter were definitely my favorite parts of the music. The dialog-less nature of the film does facilitate such an improvised score, but the oddness of its structure must have made it challenging. But the trio pulled it off. I am glad to have been able to attend the performance and look forward to more in this series. The Outsound Music Summit continued on Friday with a concert entitled “Emanations and Artifacts”. All three sets featured manipulation of found sounds (as well as found visuals) but to very different effect. The program began with Transient, David Molina’s electro-acoustic, ambient, experimental project. He was joined for this performance by Anna Geyer who provided visuals from a large collection of 16-millimeter film loops, some found, some hand-painted. The projectors and film segments hanging were themselves works of art. The performance itself was a fully improvised collaboration of sound and visuals. But the music had a very well crafted and even narrative quality to it. It was anchored by a series of stories told by undocumented workers in the U.S. about their experiences. Over this, Molina layered elements based on a wide variety of live acoustic artifacts from small bells and shakers to cello and banjo. These sources were composed using Ableton Live! into loops, rhythms and drones to create a complex ever changing soundscape. The entire 40-minute performance was captivating and full of interesting details, stretched metallic sounds, scraped strings turned into rhythms. Perhaps my favorite part was Molina’s first bowing the banjo and then strumming the instrument over the looped recording. This was combined with deeper electronic sounds and set against a set of film clips that featured cats (yes, there was some cat spotting on this evening). The next performance featured the PMOCATAT Ensemble, Matt Davignon’s projected based on cassette players and other sources restricted to cassette-like fixed-media manipulation. I was part of this ensemble, and managed to find a cassette-player iPad app for the occasion. The ensemble performed four pieces by Davignon as well as two by guest composers Daniel Steffey and Benjamin Ethan Tinker. Davignon’s pieces had a playful quality to them, and integrated the participants’ regular instruments into the media and the concepts of each piece. Perhaps my favorite was the “Avant-Jazz Trio”, which was billed as neither a trio nor really jazz. However, the end result, which featured manipulated recordings of bass, piano, drums and horns did have a jazz-like quality to it, and an ensemble-like texture. The effect was helped by the performers listening to one another as the would in a true jazz-improvisation ensemble as well as Davignon’s conducting. The pieces by Steffey and Tinker had very different tones. The source materials were more abstract, often deliberately noisy. The unfolding of Steffey’s piece reminded me of many of John Cage’s experimentations with media-based pieces, although in this case it was overlaid with recordings of speeches collected as a personal response to the George Zimmerman / Trayvon Martin case. Tinker’s piece used pre-composed cassettes that the performers manipulated based on a beautifully designed graphical score. The sounds were then passed through a looper and other effects and mixed into a single source. The final set was the much anticipated reunion of Fuzzybunny, an electronic-improvisation trio consisting of Chris Brown, Scot Gresham-Lancaster and Tim Perkis. Their music is described as “All-out ‘carnallectual’ electronic improv, rocky-roaded with pop-music fragments and sonic gags define some kind of new style, difficult to describe.” And this was their first time playing together as group in a decade. The performance started right way into their high-intensity onslaught of electronic sounds, pop-music clips, and loud hits. Perkis anchored the music with his steady laptop emanations while Chris Brown deftly moved through a variety of rhythms and familiar samples from popular music – I have a particular soft spot for the R&B clips – and Scot Gresham-Lancaster explored timbral possibilities of guitar and looping. The prevailing texture was loud and driving, but there were more subtle moments as well, with wobbly synthetic sounds, quieter percussive hits and scratchier recorders of older pop music. But then they would hit us with something surprising and louder. For a band that hasn’t played together in over ten years, they were very tight. And one could tell they were having fun (something that Brown mentioned during the pre-show Q&A as well). It was certainly a fun performance for those of us in the audience as well, and there was no question that we were going let them play a little longer, especially if it turns out to be another ten years before we can hear them together again. Overall, it was another strong performance for this year’s summit, and one I was proud to be personally involved with as both a performer and curator. Outsound Music Summit: Thwack! Bome! Chime! Today we continue our reviews of the Outsound Music Summit with Thwack! Bome! Chime!, an evening of modern percussion performances. There was quite a bit of Thwack! and more than a couple of Chimes. But I am not quite sure about the Bome! part. The concert opened with a solo set by David Douglas performing with acoustic percussion, MIDI controllers and a laptop running Max/MSP. His approach, visually, physically and musically, is to integrate the traditional drums, cymbals and acoustic noisemakers with the electronics in a single unit. I had last seen Douglas perform at the Luggage Store Gallery before Reconnaissance Fly. I recalled that performance being richly textured, but his setup and musical performance on this night was more varied and sophisticated. He began with short taps on a drum with granular and pitch effects cascading out of the percussion sounds. These gradually evolved into more complex rhythms and drum rolls augmented with tonal pitches. The acoustic sources expanded from the drum to percussive hits with sticks and other implements, with more pitched elements and eventually faster more rhythmic playing. As the set unfolded, there more complex polyrhythms as well as very subtle quiet sections, and sounds that were further afield from traditional percussion, with long electrical drones. There was an abrupt shift the cymbals with gliding pitch shifts and long tones. He also used lights and a mobile device to control electronic elements. At one point during the set, the music became more like techno/electronica, with repeated rhythmic patterns and in-time delays and hits. His performance continued as a single, continuously changing improvisation for the duration of the set. The next set featured Falkortet, a local percussion ensemble that composes pieces for itself in a variety of styles. Members of the ensemble include Lydia Martin, Ed Garcia, Timothy Black and Josh Mellinger. The ensemble entered from the rear in the hall in a slow procession, with metal percussion and led by Martin on a conch shell. The scene and sound reminded me of a wedding or celebration band that one might find in South Asia or the Middle East. The performers took their seats at various points of the stage and the rhythm steadied into a syncopated pattern with a bit of a swing. It grew louder and more complex over time and then all at once soft. The remainder of Falkortet’s set featured a series of short compositions in a variety of idioms and was quite a contrast to Douglas’ single abstract improvisation. There was a piece with three standard drum sets and a piano that included both loud drumming and a section that was jazz or tango-like. Another piece featured a marimba, a large hand drum and bells that reminded me of gamelan instruments, especially as the music unfolded first a single unison phrase that splinted into more complex polyrhythms and variations. After the piece, they explained that the bell instruments were in fact prototypes for an “American gamelan.”, and that many of their instruments were made from found objects or recycled materials. A couple of other pieces that particularly caught my attention was a marimba quartet with soft chords and subtle changes at different rates. It was quite meditative. The last couple of pieces with vibraphone, marimba and drums had a more jazzy feel, with familiar minor chords, blues scales and even a bit of a funky vibe at times. It was a fun way to close the set. The final set featured the premier of Seems Like An Eternity, a new composition by Benjamin Ethan Tinker for percussion and electronics. Tinker, who performed in the piece on Arp 2600 and an Echoplex, was joined by Lydia Martin and Tim Black from the Falkortet, as well as Shani Aviram on kalimba, and April-Jeanie Tang and Daniel Steffey from Touch-the-Gear night. I was quite interested in hearing this piece after learning about it during the Composers’ Forum earlier in the week, and was glad to see that most of the audience stayed to support the performance as well even though it was already 11PM. It had a very elemental theme “evoking the desert night sky”. On a more technical level, it subverted the usual character of percussion by avoiding discrete sounds and instead using the instruments to generate drones. It unfolded with long tones with pitch variations, some of which reminded me of whale songs. A cymbal roll added both grown and higher-frequency content, while rubbing on timpani drums and rubber mallets on a wood surface added a thick middle-frequency drone. It was not purely drone, however, as bits of crackly sound came and went,. There were also empty spaces in the sound. I did find myself listening for the Arp within the soundscape, and identified some very noisy sounds and wobbly arpeggios from the instrument. At one point there was a very elemental loud metal shake evocative of a thunderstorm. Again, the overall drone was broken up by the sounds of small metal pitched percussion. The sound grew softer and lower in frequency, with the electronics moving into a subsonic realm where the waveform became a chain of discrete percussive sounds. After an electronic solo, the other instruments returned in, converging on a single tone. The sound became crunchier and more varied in timbre, with granular elements and then grew into a series of loud swells towards the end of the piece. This was a long concert, and some ways a bit of endurance test. But it was rewarding to fully experience all three sets their entirety, as it is not that often one gets to hear an entire concert dedicated to percussion like this. The 2012 Outsound Music Summit began this Sunday with the annual Touch the Gear Expo. Visitors have a chance to see and try out the equipment used by musicians and sound artists. Although we had fewer presenters this year, we had a variety of instruments and devices, and a fairly sizable crowd of visitors. In the above image, we see Matt Davignon presenting effects pedals driven using a Casio keyboard, and Joe Lasquo presenting laptop-based programs with Max/MSP. One of the fun aspects of Touch the Gear is getting one’s hands on instruments that one only sees on stage. 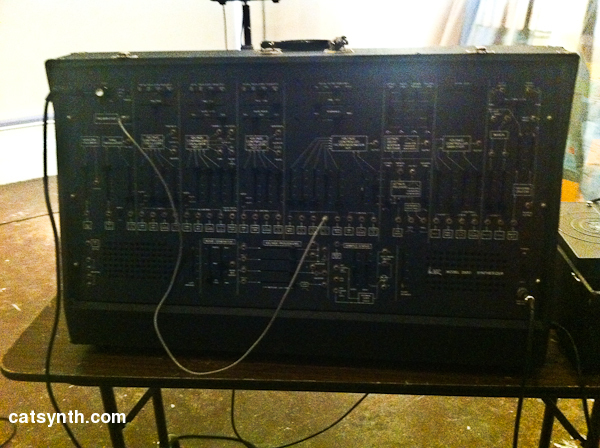 For me, one of those opportunities came when I got to play the Arp 2600 that Benjamin Ethan Tinker brought to the event. It was only a little over a week earlier that I heard him play it at the Luggage Store Gallery. The organic head-like element contained several mechanical and optical sensors that one could touch or put ones hands near to affect the sound. A second part of the installation included a mechanical “robot” that played a set of strings with a pickup. The performer can affect the operation of the robot and the sound through electronic controls. Other unusual electro-acoustic instruments were presented by Walter Funk and Dan Ake. Walter Funk’s metallic instrument called Ulysses offered opportunities to explore different resonances and timbres through sheets of metal, rods and springs arrayed throughout its body. Dan Ake’s invention was a series of gridded metal inside a large wooden box, than one could excite with a variety of objects, such as bows, rods and a glove with long wooden fingertips. I was presenting at this event as well. I always try to bring something a little different each year. This year, I decided to go with two ends of the technology spectrum: an iPad running Animoog and iMS-20, and a Eurorack modular system with a Metasonx R53, Make Noise Echophon, Malekko Heavy Industry Anti-Oscillator, and several others. Both technologies caught people’s attention, with some more excited about the analog modular system with its physical knobs and cables, and others gravitating towards the iPad. Andrew Wayne presented a very tangible set of objects containing unpopped popcorn kernels in aluminum trays and other contains, augmented with contact microphones and electronic effects. He assembled his own contact mics to use with these acoustic sources. Other participants included CJ Borosque with an Alesis Air, Laurie Amat with vocal and ambient sources into a Line 6, and a surface by April-Jeanie Tang with rubber-ball mallets. Through contact miss, the action of the rubber mallets and the surface and transmitted to effects processors for a deep, haunting sound. Tom Duff presented a series of software processes that could be randomly controlled from a MIDI controller. Despite the randomness, it was quite expressive after playing with it and dialing in on particular processes. He also had a couple of critters from Bleep Labs. Long-time participants Tom Nunn and David Michalak were back again with the most recent incarnations of the sketch box. You can read an interview with Tun Nunn and discussion of his musical inventions here on CatSynth. And finally, Bob Marsh was back with his intriguing and “charismatic” metal creations. I do tend to gravitate towards metallic sounds when looking for new material, something which seems to be common among those who are looking for invention and discovery in musical sound. On Monday night, the summit continued with the Composers Symposium, a panel discussion featuring four of the composers in this year’s festival: John Shiurba, Christina Stanley, Benjamin Ethan Tinker, and Matthew Goodheart were on hand to discuss their work. And as a first this year, I acted as the moderator for the evening. It was a great experience, and I did not have to do very much besides seeding the discussion with a few questions. From those starting points, a lively discussion ensued among the composers as well as dialog with the audience. We talked about the role of notation in each of the composers’ music, such as Stanley’s use of paintings as her scores and Shiurba’s use of graphical elements derived from print newspapers (a major theme of his piece this year); and the dual role that these artists played as both composers and performers. One of the things that made this panel work was the variety of musical disciplines, styles and backgrounds among the participants, as well as the interest that the audience brought to the discussion with their numerous questions. Everyone had criticisms of the terms “new music” and “experimental music” that are often used as blanket designations for the music featured in the summit and indeed much of the music reviewed here on CatSynth, but that was to be expected. The two hours of the discussion went by rather quickly, and I’d like to think everyone on the panel and in the audience found the experience enjoyable and illuminating. I would definitely like to do more of these at events in the future. Today we look at last Thursday’s Outsound show at the Luggage Store Gallery, which featured music by Shani Aviram, Benjamin Ethan Tinker, and Matt Ingalls. As I have mentioned in previous articles, the acoustics at the Luggage Store Gallery can be quite challenging. One of the things that made this performance notable is that several of the performers made creative use of the acoustics, working with it rather than against it. This was true of the initial piece for solo snare drum by Shani Aviram, where the staccato notes of the drum reverberated around the room in a manner that was quite dynamic. There were some exceptionally loud moments, but I liked the overall texture. The set also featured compositions by Aviram for cello and electronics (performed by Devon Thrumston), and computer and Arp 2600 (performed by the composer and Benjamin Ethan Tinker, respectively). The best use of the room acoustics was by Matt Ingalls, who performed a 30-minute continuous tour de force of energetic microtonal improvisation on clarinet. His movement affected the diffusion of the sound from the instrument and off the walls of the room, adding more microtonal and timbral variation. It is difficult to describe the experience fully, but it was a very impressive performance. I managed to capture a few seconds on my iPhone, which you can see below. In the subsequent break between sets, I went up to see the analog electronics. 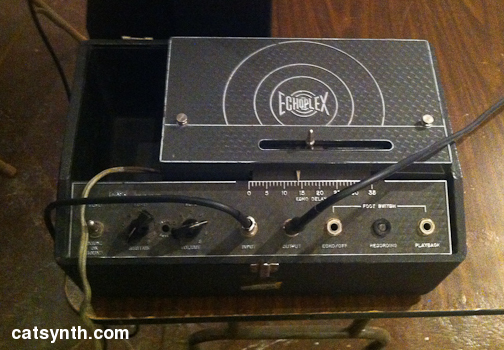 In addition to the Arp 2600, there was also an analog Echoplex that appeared to be in relatively good condition. In the final set, Ingalls joined Shani Aviram and Benjamin Ethan Tinker for a group improvisation. 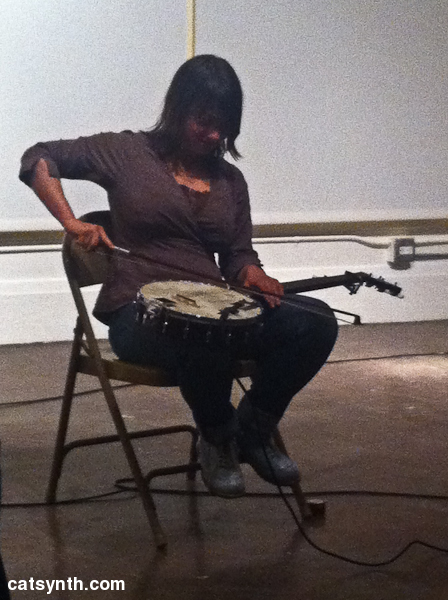 Aviram performed using a banjo with electronic pickup, which she bowed. The resulting long tones were used as input into the 2600 and Echoplex for a complex texture of sounds with long tones generated from the banjo and overlays with loops and echoes. Ingalls was once again on clarinet, which he matched timbrally to the electro-acoustic sounds. Once again, the acoustics of the room worked with the longer and slower tones of improvisation and the electronic echo effects. It was a good night of music overall, and one I almost missed due to having just returned from an intense out-of-town trip. I am glad I made the effort to be there.